From the Publisher: It’s just a small story really, about among other things: a girl, some words, an accordionist, some fanatical Germans, a Jewish fist-fighter, and quite a lot of thievery. . . . I am at a loss for words. I began reading The Book Thief on Sunday and finished it on Monday. Admittedly I was motivated to try and squeeze it in before the end of the year as my last pick for the War Through the Generations: WWII Challenge, but I truly was swept away by the book from the very first page. After I finished the book, I told my husband there was no way I could review it. What could I say besides that it's brilliant? The writing, the characters, the presentation of the story--every word of it is just plain brilliant. I suddenly understand why so many people gush over this book. And now it's my turn. I do not carry a sickle or scythe. I only wear a hooded black robe when it's cold. want to know what I truly look like? The novel is narrated by an unusual character, that of Death. Death offers a different perspective than a human would have. He is straight forward with his insights into the human condition, sometimes to the point of being blunt; and while his position offers him some detachment, he is at the same time drawn to humans and their stories, as he is in the case of Liesel Meminger. Death is telling a story that happened in the past and as such offers spoilers along the way. This may be disconcerting to some, but I found the foreshadowing comforting in this case. It seems fitting given how omnipresent Death is. And like Death, I have always been more interested in the process, the chain of events leading up to something, than the ending itself (hence my enjoying a mystery even though I can see the ending coming a mile away). Death is not impartial despite what he wants the reader to believe, however. There is a hint of bitterness behind some of his statements, but he also has a heart, even if he is himself not human. The characters are fully fleshed out, even the minor characters. The author makes their weaknesses and strengths clear. And these come out all the more fully in their interactions with one another and their relationships. The main character, Liesel, has suffered much loss in her young life. She is nine when she comes to live with her foster parents. Her foster mother is a bit rough around the edges and takes a little getting used to, but she has a big heart. Liesel takes to her foster father right away; he teaches her almost immediately how to roll a cigarette. He also is the one who teaches her to read and encourages her interest in books. Also among my favorites are the neighbor boy, Rudy, who becomes Liesel's best friend, the mayor's wife with the big library, and Max, the Jewish man hiding from the Nazis. While a heartbreaking and brutal story at times, this is also a novel of hope and resilience. It demonstrates the ugly side of humanity as well as the beautiful. The evil of the Holocaust and the actions of the Nazis during World War II are well known. Set in a German town outside of Munich, The Book Thief offers the reader a glimpse of what life was like for the average (non-Jewish) German during that time in history. Liesel and her friends are members of the Hitler Youth, a requirement for children her age. There are book burnings, war rations and air raids. As the Jewish prisoners are paraded through the town on their way to the concentration camp Dachau, the town folk flock to the main street to watch. Complacency was all too common during that time period, whether out of fear or hate. Those who did intervene were beaten and often punished for reaching out to help. The power of words is a strong theme throughout the novel. The first book Liesel steals is one she finds in a graveyard after the death of her brother. She has no idea what the book is about, being that she is unable to read. Somehow she knows, however, that the book is a treasure worth keeping close. It would be the first of many books that she would steal, earning her the title of the book thief. It was through words that Adolf Hitler and his followers perpetuated the prejudice and hate against the Jewish people, spurring the violence on. It was with words that Liesel left marks on the mayor's wife out of anger. But it was also words that comforted during the air raids and soothed the injured soul. Words brought friends together and words that empowered a little girl, giving her courage and strength. The writing is beautiful, almost poetic. There is a certain rhythm to Death's narration. The book may be long but I savored every word. I even found myself rereading passages not because I didn't understand them, but because I wanted to re-experience the words, feel them in my mind and taste them on my tongue. 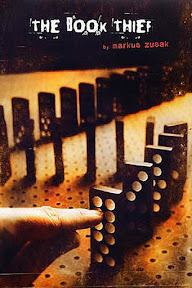 Markus Zusak's The Book Thief one of those books that will haunt me for a long while. So much for being at a loss for words, eh? Book Source: I bought this book in November of 2008 through Amazon. This is an awesome book isn't it! And I think it is one that would hold up well to a reread because I suspect it will be one of those books that you will find something new in it each time you read it. I'm so glad you loved it :-) Reading your review makes me want to reread it, too. I totally get your dilemma of writing a review for it because I thought similarly. I felt there was just no way I could write about it and really do it justice. It is truly an amazing book. Parts are still vivid in spite of the fact that I read it at the end of 2007/beginning of 2008. I'm so glad you liked this book, Wendy! I agree with the others that a re-read would be time well spent. Wonderful review, Wendy! This is truly an outstanding book. Excellent review of an excellent book. I loved this book SO much. Great review! It is a book that will stay with you for some time...lovely review! So happy this was a home run for you Wendy. I don't think I've read any reviews where the reader wasn't touched by this book. (I thought it was fabulous as well). Thanks for the terrific review and bring the book back to mind once again. I found the foreshadowing comforting in this case. Exactly, I couldn't have read it without the foreshadowing. I'm glad you read it, and enjoyed the experience. Zusak is amazing, so talented. I even like his I Am the Messenger a bit better. I've heard so much about this book, and it certainly means something to me when you say you had a hard time reviewing it (though you did an excellent job). I know how that feels. I dread writing reviews of the great ones. I read a book before blogging called Castle in the Forest by Norman Mailer. The narrator wasn't Death, but one of the devil's helpers, commenting on the life of Hitler, and how the underworld had been grooming him since birth. I love narrators like this. Crazy perspectives! What a beautifully written review. And you were worried! I loved this book, too. I now count it among my all-time faves. I'll get this on the challenge blog very soon. Oh - I am so glad you enjoyed this book, as I think I may have recommended it as a next read for you (or maybe not). Anyway, your review definitely does this book justice! The power of words came through so very loud and clear to me. I know that this is one book that I will read and re-read over time. My face-to-face club is reading this one and I Am the Messenger for our next meeting. I can't wait to talk about them. Loved your review. I read this marvelous book about two years ago, and parts of it are still with me. I read and reviewed this remarkable book a few months ago. You're right, Death is somehow almost a bit reassuring, with his(?) gentle ways. wow - can you believe I'd never heard of this book? I am definitely putting it on my TBR list! A five-star review! I haven't read this, and despite all the raves, am not sure it's my thing...but you have yet to steer me wrong, Wendy. Thanks, as always, for an informative and enlightening review! Wonderful review, Wendy - it truly is an amazing book, isn't it? I thought this was a pretty good book, and I absolutely love I Am the Messenger. I had this book on my shelves for awhile and then it disappeared. Maybe I loaned it or lost it or??? But I am jumping on my library website right now to put it on reserve. Your review is brilliant and convinces me that I will love this book!! All I can say is wow! I bought this book earlier this year and now I'm wondering why I haven't read it yet. Update: I have it requested from my library. I am 13th in the queue (so apparently everyone wants to read it)! I'll be looking forward to it. Oooooh I want to read this, I want to read this!!!!!! this has become one of my all-time favorite books. I can just think about it and start getting teary-eyed. It was just so amazing. I'm glad it was also a 5 star book for you! Fantastic review Wendy! I have this book and have heard so many people say how much they loved it but haven't managed to squeeze it in yet. I really need to though, don't I? What an amazing review! I'll have to add this one to my list. What a wonderful review Wendy! I have heard a lot about this book and have been tempted to read it, though your review may just push me into it! Thanks! I read this book last year. It's really amazing, isn't it? I didn't mind the foreshadowing either. It's the Holocaust, so you gotta know bad things are going to happen. And I still cried! It IS amazing, isn't it? Glad you've joined the love club for this one. I was surprised at how much I loved this book! It took me awhile to get into it with Death as the narrator but I ended up loving it. It's such a beautiful book. I'm glad you enjoyed it. Your review was excellent Wendy. You hit all the main points and wrote them beautifully. This is one of those books that everyone should read, it is so powerful. Congrats on finishing the challenge...and I knew that book would be a fantastic choice...yipee to the masses who helped you choose. I’m so glad you made time to read this before the end of the year. I read this one years ago and LOVED it. Great review! I'm fascinated by the idea of Death as the narrator. Stunning review for a stunning book! I read this one not long after it came out for an Adolescent Literature class, and I cried through the whoooole thing. It was just beautifully and cleverly done, and it's coming up for a re-read soon. Thank you everyone for your comments. This is one popular book! I hope you all have a very happy New Year. We posted your review on War Through the Generations. I really did try to read this but then we were moving and all kinds of things kept getting in the way. I've been meaning to try it again but I haven't gotten around to it. Jen - It does seem like one of those books that deserves a person's undivided attention. Hopefully you'll be able to try again when things are a bit quieter. This is one of those books I couldn't wait to get...and then once I got it, I never read it! It is on my must read list for 2010 though. Julia - Thank you. I hope you do get a chance to read The Book Thief! Melissa - I was the same way with The Book Thief, Melissa. This one sat on my shelf for awhile before I finally got to it. Remember my Friend the Non-Reader?